It seems pretty clear in retrospect that Donald Trump’s candidacy for the Republican nomination for president effectively rendered Jeb Bush’s candidacy superfluous. Once the Big Jet started gaining altitude, Jeb was reduced to contrail. And yet, at least one national reporter assigned to cover him has written movingly that she will miss him for his earnestness and sincerity, his vulnerability and awkwardness. …Here’s another example of where The New York Times stands head and shoulders above the other news organizations. In a story posted tonight, reporter Ashley Parker wrote a compelling story about the many ways in which Bush endeared himself to her and other reporters following him. “Even as he stumbled as a candidate, he was, in many ways, a reporter’s dream. “He gave out his email address easily and freely and, early on, even responded to queries sent there. “In a cycle where so many other candidates were able to toggle effortlessly between soaring speeches and masterful debate performances, between well-rehearsed outrage and manufactured indignation, Jeb almost seemed to think aloud in real time, and we got to watch him muddle and bumble through, just like any real person. “He was deeply self-aware, talking openly about how bad he was at debates and explaining, honestly, that his problem was answering the moderators’ questions too directly. Do you believe me now, not all Republicans are bad folk! I don’t think I’ve ever suggested that. Do you think I have? No, just giving you a bad time! I’m already so tired of all the campaign jibberish, don’t think I can handle it another 8+ months….will have to live under a rock for a while. 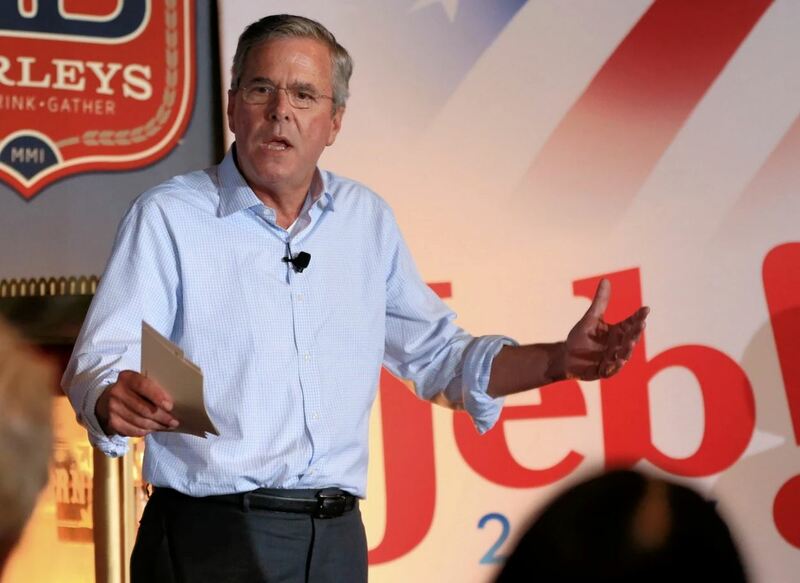 It saddens me each time a nice guy finishes last — especially when, like Jeb, they’re highly qualified. I’m having twinges of regret about him, too. He just got blowed (stet) away in the hurricane. Wolf in sheep’s clothing. Bush may have talked about the “special education” people, but as governor of Florida, he destroyed education by insisting on worthless reforms that reduced the school to bashing teachers, chasing test numbers, creating corrupt charters, and siphoning money into the pockets of hocus-pocus edbiz charlatans. In this instance, he was in good company with his brother AND Mr. Obama. Thanks for sharing Ms. Parker’s view of Jeb. He seems like a true gentleman…guess less than 10% of the electorate are voting for his type! Between you and Ms. Parker, I have some dictionary work to do: Contrail, Self-Agrandizement, Fulminating, and of course Felictous. Oh well, at least in retirement, I have time to learn some things I should have learned in high school. It’s a term that stuck; rolls off the tongue or through the brain. The key is not to over-use it — or any good word. That Jeb was a more intelligent, earnest and caring Bush than Neil or George was immediately apparent. However it was also obvious Jeb had inherited the Bush family tendency to step on its own appendage. Nice guy, wrong milieu. I’ve never heard of Marvin. They grow ’em on trees down there in Texas, don’t they? Great column, Jim, thanks for sharing.